The Taliban have been holding hostages from Lakki Marwat in Pakistan since the feud that started when they rudely tried to force extreme shariat on a wedding party. A tribal Jirga of Elders has met, and given a deadline to the Taliban to release the hostages, and it looks like they will once again take action with or without the government. 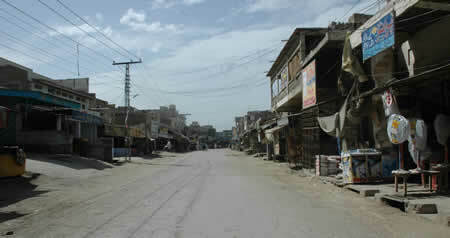 The Taliban have taken over the region, and the once vibrant market street of Tank is now a deserted and destroyed shell. Note that the article below paints the miscreants as “wannabe Taliban”, however leadership within the Taliban is so fractured right now that the difference between “wannabe” and real is faint if it exists at all. In Pakistan the Taliban are now striking more frequently, burning more CD shops, beating more people for dress violations, attacking and killingÂ Army personel, and generally causing a lot of dissension. They are reinforced now because school is out, and it’s a time when their ranks swell from the brain-washed children exiting the madrassas. When you brainwash students and then turn them loose like savages, nothing but evil can come of it. I am reminded of the student justice committees and shakedowns in Nepal, and communist countries like China, as well as the students who marched millions of Cambodians to their graves in the killing fields. Aghanistan has wised up, and they know that this is the season that the Taliban will try for an offensive due to the re-inforcements from Madrassas. To prevent supplies, explosives and weapons from crossing, as well as to impede the speed of movement of the Taliban in Afghanistan they are forcing people to leaveÂ Pakistan registered vehicles, including bicycles,Â at the border if they want to cross. All of this is aided and abetted by foreign governments, in particular Saudi’s Deoband mullah funding and Iran’s passing of weapons. There are definite schisms, and lack of central authority in all the groups so we can expect as much fightingÂ among the Taliban, the tribes, and the sects,Â as we can against Afghanistan. It’s well past time for Pakistan to stop being foolish by letting other countries use their countrymen as pawns against their nation. Do the Pakistanis wish to become like Hamastine, or like some areas of Baghdad? Shouldn’t the leaders of the Jihadis of all stripes and types who all take foreign payÂ be wiped out instead of the innocents?